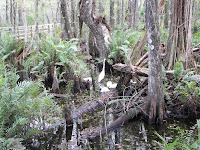 We have a wonderful nature preserve just down the road from us. We've been there a couple of times to walk the boardwalk through the Slough (pronounced "slew"). 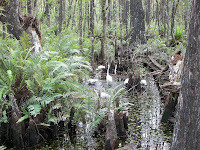 It is 2,500 acres of wetlands measuring approximately 9 by 1/3 miles. 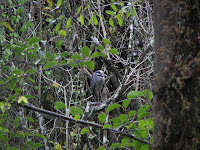 This linear ecosystem is home to a diverse population of plants and animals, including a few considered to be endangered. 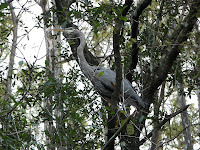 Besides the usual white heron and ibis that are everywhere we saw a Yellow-crowned Night Heron and a Great Blue Heron sitting in a tree. Another nice place to walk in Ft Myers is Lakes Park. 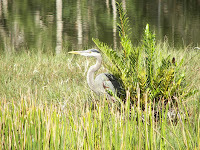 Currently, there is some construction in the area, but it is still a great opportunity to see some diverse wildlife. On our first trip, we saw an alligator but it was too far away to photograph. Since Lakes Park is very close to where we live we asked if there are alligators in our lakes. One of the residents who lives here full time said "of course" as if I was asking about squirels. We've seen otters but no alligators. 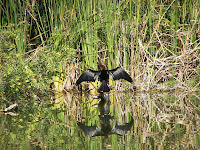 The black bird seen drying his wings is an Anhinga. They are commonly called the "piano bird" because, I am told, during breeding season the feathers on their wings resemble piano keys.